At the Foot Clan’s training dojo in Westchester, Karai seeks the elderly instructor Toshiro for council. Having been demoted from her position as the Foot’s second in command, she is unsure of her own future and is concerned about where her grandfather, the Shredder, is taking the Clan. Toshiro suggests that to find her path for the future, Karai should look to the past. The Past. Under the guidance of her father, Oroku Yori, the Foot Clan has become a more modern criminal organization, more concerned with intimidation through lawyers than the old ways. Even as a little girl, Karai is disgusted by her father’s complacency (and his habit of being bossed around by his lackey, Nakamura). One day, while looking through her father’s vast library, she discovers “The Secret of the Foot”, an ancient text describing the Clan’s history and secret ninjutsu arts. Karai spends the rest of her formative years studying the book in private while maintaining the façade of the perfect daughter for her parents. One night, Karai has a dream. She is approached by the spirit of Oroku Saki (who instructs her to address him as grandfather). Karai believes him to just be a part of her dream and nothing more, but Saki slashes her across the hand and the pain proves that he is a true spirit. 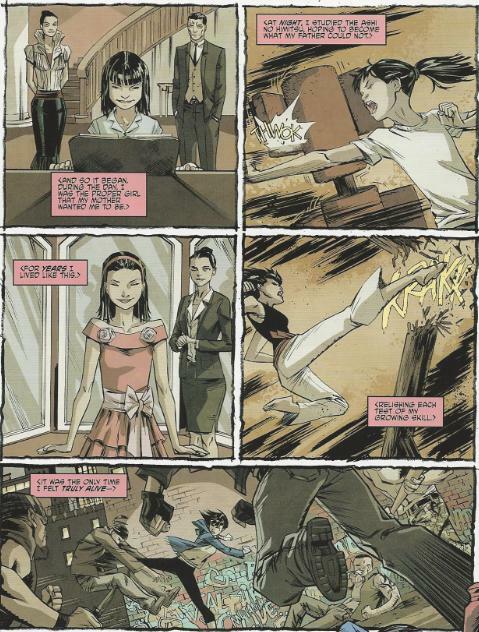 Saki entices her to embrace the old ways of the Foot Clan by overthrowing her father and using the instructions in “The Secret of the Foot” to restore him to life. Karai agrees to bring Saki back, but only after she has restored the honor of the Foot Clan on her own. Karai awakens from her dream and finds scars from Saki’s attack on her hand, proving that she didn’t imagine the whole thing. Karai spends the next few years gathering thugs and lackeys to train in the ninja arts. She begins secretly hitting all of her father’s operations, crippling his incarnation of the Foot. She then kills Nakamura as payback for his years of disrespect. Eventually, the stress of trying to run his failed criminal empire gets the best of Yori and he dies. Karai then swoops in and takes command of the Foot, reshaping it back into the ninja clan it once was. The present. Karai’s council with Toshiro is interrupted by Dark Leo. Leo is unimpressed with Toshiro’s productivity, as the Shredder requires more bodies to throw at his enemies. Karai defends Toshiro, but her disrespectful tone offends Leo, who reminds her of her place: Beneath him. He brow beats Karai, who uses all her restraint not to attack him. Seeing her resentment, Leo offers her the opportunity to fight him and prove that she’s better. Karai eagerly accepts his offer and the two do battle. As they fight, Karai senses something different about Leo; that he’s holding back his killer instinct. He has many opportunities to kill her, but passes them all. She sees this weakness and, thinking ahead, elects to throw the fight. Karai accepts her place beneath Leo and the Turtle walks out, believing he has made his point. Karai tells Toshiro that she now sees what she must do to take control of her future. Two days later, at the Shorai Research and Development facility, Karai gathers a gang of thugs who are eager to gain power. She tells them that in order to gain that power, they must prove their worth. One thug (with purple sunglasses and a Mohawk) asks what they have to do to pass her test. She strikes him and says that the power will belong to the last one standing. *This issue takes place between TMNT Villains Micro-Series #4: Alopex and TMNT (IDW) #25. *Karai was shown (in a flashback) resurrecting Oroku Saki with the “Secret of the Foot” in Secret History of the Foot Clan #4. *The two thugs seen amongst Karai’s congregation at the end (Bebop and Rocksteady) last appeared in TMNT Villains Micro-Series #4: Alopex. *This issue was originally published with 2 variant covers: Regular Cover by Tyler Walpole, Cover RI by Smith. Karai, Karai, Karai. Now there’s a character who has undergone quite an evolution since her debut back in 1992. When Mirage introduced her, she was an equal to the Shredder in terms of rank and his replacement as leader of the Foot. She shared no connection with Oroku Saki beyond that and was a fairly sympathetic character; not really a villain (she fought alongside the Turtles more than she fought against them). The 4Kids cartoon introduced her most notable claim to fame, sort of fusing her with Pimiko of the Image TMNT series, turning her into the Shredder’s (adopted) daughter. This aspect of her character would stick and become so well known, most folks incorrectly cite it as part of her Mirage history. Her sympathetic qualities would remain and she’d undergo quite an arc across the 4Kids cartoon. Likewise, the recent Nickelodeon cartoon has been doing wonders with her parentage and friend/foe relationship, but considering how recent the season one finale was to the writing of this review, I won’t elaborate at the risk of spoiling a great twist. I will say that the Nickelodeon Karai is quickly becoming my favorite incarnation of the character, stupid hairdo and all. Then there’s IDW Karai. 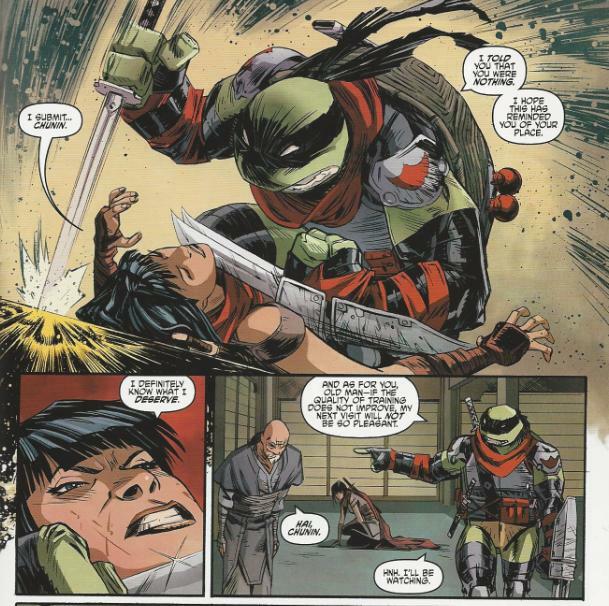 While the familial relationship to Oroku Saki remains, any traces of her sympathetic attitude toward the Turtles have been absent. Even the “granddaughter” aspect has been superficial at best, as she’s shown nothing but resentment toward Saki rather than devotion (he had nothing to do with raising her, in this version). 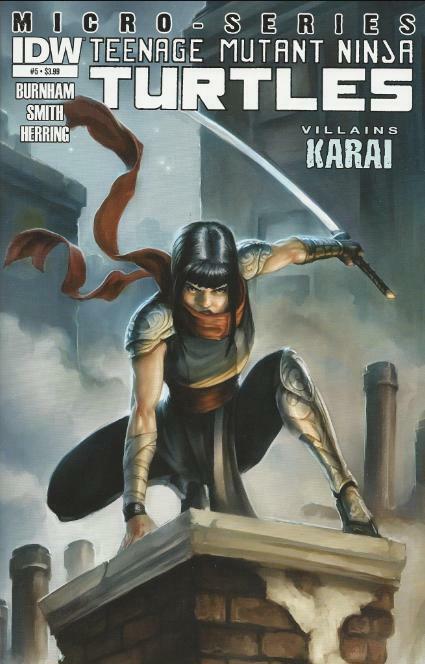 So with her two most familiar qualities removed by IDW’s writers, this incarnation of Karai is also only superficial: Karai by name, but lacking any of her fundamentals. And yet, as I pointed out in the beginning of this refresher course, Karai has always been a rather malleable character, prone to being transformed at the whims of the authors. Still, without any fundamental Karai-isms to latch onto, this version of the character has rung rather hollow these past couple years. Just a lot of arm-folding and pouting every time Shredder tells her to button her lip. 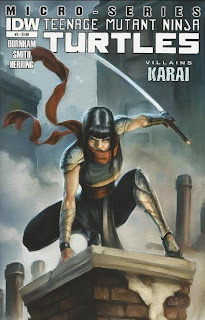 Burnham endeavors to flesh IDW’s vision of Karai out with this long overdue origin story which ties into his Secret History of the Foot Clan miniseries rather well. We learn about Karai’s childhood, how Oroku Saki manipulated her into bringing him back from the dead and how she wrested control of the Foot Clan from her incompetent father. It’s a very informative story and, character-wise, you can appreciate Karai’s perpetual frustration and resentment throughout past issues just a little bit more. Shredder encouraged her to bring him back by feeding on her love of the past, but then proceeded to demote and demean her for not looking to the future. In the end, she learns a valuable lesson about balancing tradition with ambition (and also that Dark Leo’s a prick) and important story arcs are moved forward. And yet, Karai doesn’t feel like a richer character for any of it. At best, she’s just another Starscream; a bitter second-in-command determined to seize leadership at any cost. Her motivations (vengeance against Shredder for manipulating her) feel especially redundant on the heels of the Alopex microseries, which ended on almost precisely the same note. If anything, all these micros and the main series seem to be accomplishing is diminishing the Shredder’s position as a competent villain. I mean, just look at how he’s setting himself up! He’s put all his faith in a brainwashed nemesis to lead him to glory, whilst simultaneously alienating his two trusted henchwomen to the point where they BOTH want to kill him. Fred Wolf Shredder would be embarrassed. Getting back to Karai, even though she’s a character who is always evolving, I think it’s important to maintain past elements into each incarnation. Discarding her devotion to the Shredder and sympathy for the Turtles insures we won’t be sitting through another retelling of Karai’s crisis of conscience, but it also eliminates the only qualities to her character that were ever any interesting. Take it all away and we’re left with just another scheming female ninja second-in-command out to overthrow the Shredder… and dammit, we’ve already got one of those! On the subject of the art, Cory Smith turns in some lovely pages. I may not be kind in my appraisal of IDW Karai’s character, but her design is my favorite and Smith has given one of her best renderings so far. At times I felt her features were a little too sharp for the youthfulness the script was trying to get across (she looks a bit older than I think she was meant to be), but beyond that I’ve few complaints. The action layouts were well done during the fight with Dark Leo, though I think the centerpiece to this issue was the page in which Karai assassinates Nakamura with her bow and arrow. Herring’s colors complement Smith’s lines nicely. I particularly liked the softer pallet of the 3-page dream sequence. It looked fuzzy and washed out, but only subtly so. It’s nice when a colorist doesn’t overdo it. Karai’s microseries left me feeling rather empty. As an epilogue to The Secret History of the Foot Clan, it was certainly enlightening; straightening out the timeline of the Foot Clan’s resurgence and filling in any leftover narrative blanks. But regarding the intended purpose, to give Karai some extra character, I felt it did just the opposite, robbing her of the elements which have made her stand out these past ten years. "And yet, Karai doesn’t feel like a richer character for any of it. At best, she’s just another Starscream; a bitter second-in-command determined to seize leadership at any cost. Her motivations (vengeance against Shredder for manipulating her) feel especially redundant on the heels of the Alopex microseries, which ended on almost precisely the same note. If anything, all these micros and the main series seem to be accomplishing is diminishing the Shredder’s position as a competent villain. I mean, just look at how he’s setting himself up! He’s put all his faith in a brainwashed nemesis to lead him to glory, whilst simultaneously alienating his two trusted henchwomen to the point where they BOTH want to kill him. "Fred Wolf Shredder would be embarrassed." Indeed. And if you ignore Fred Wolf Shredder's constant/counterproductive insulting of everyone, he was still more ahead than he should be, compared to other Shredders (excluding what happened with Baxter, who was a shaky ally to begin with, and the various, freshly-created mutants who turned on him, as the show was opposed to giving him more permanent henchmen for whatever reason). 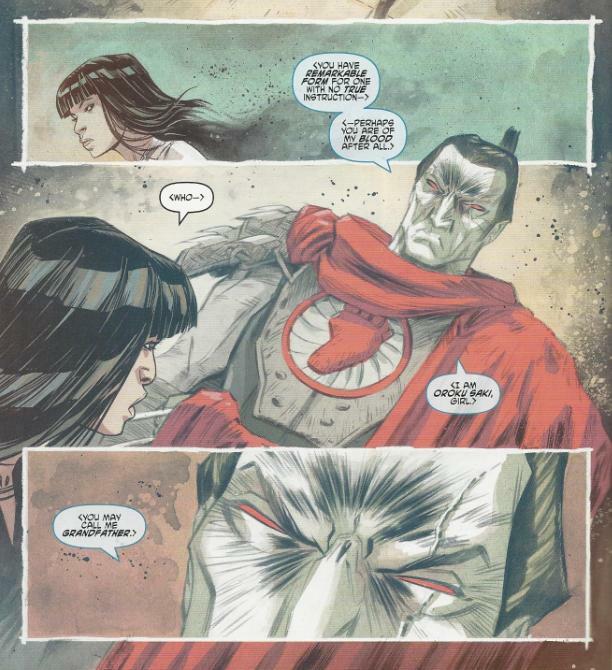 If anything else, a better comparison for IDW Shredder is to 2003/4Kids Shredder, who was known for the same thing: alienate most of his subordinates, even though, he did have their loyalty originally (Hun, Karai and maybe sorta with Baxter). Though, the IDW version is somewhat less malicious about things (for now). I haven't seen much of the Nicktoon Shredder in action, but I heard he doesn't do much of that. Which is good. And, yes, I thought the same Starscream-esque pattern after reading the Apolex micro. Might give the two something in common, since they are paired quite a bit during missions (early City Fall, Secret History). On the plus side, the Bebop/Rocksteady subplot is finally kicking into high gear. After stealing the Ooze from Burnow, I thought Karai's role in events leading to the creation Bebop/Rocksteady was done. It now seems she will or could have a larger role with the two punks. If so, could she potentially use them or make them loyal to her and the Foot cause and eventually go against Shredder's, if she so chose? On another line of thought, one line of dialogue where Karai said (after Dark Leo left), "I have to change [Shredder's] mind [about going with Leonardo]." Could it be that she might present Bebop and Rocksteady as a more viable alternative of minion than Dark Leo? As you pointed out in your "Beware the Lotus" review, Mark, Shredder ultimately won over Lotus in terms of Krang's right-hand ninja, since "his demeanor of pure evil makes him a more reliable underling than a more competent one, capable of remorse and compassion." I think I'm quoting you right, as I don't have the link in front of me, ATM. Potentially, two punks who would fully use and likely enjoy the destructive might that would come with their mutations might be slightly better as "Dark Leo" hesitated to kill and plus there's the brainwashing. The latter can only be so effective or last for so long. And all that would be doubly ironic, if Karai actually betrayed Shredder, anyway. Just thinking out loud. And I'm sure what I said would be Jossed later on, but it's fun to speculate. Good assessments about IDW Karai. And while I don't dislike her, I can appreciate how her flaws would be rather off-putting, compared to every other version of Karai. Good eye on catching that "Mutanimals Live" reference in the wall graffiti. I actually wouldn't have noticed if you hadn't pointed it out. But I can't get too excited over it, on account of the fact it occurs in a flashback while Karai is still very young, and we all suspect Hob is gonna be the one who might start up a new incarnation of our old mutant cronies. Old Hob and Slash could be forming their own, all-new Mighty Mutanimals. And isn't Old Hob just a retooled version of Scratch, anyway? Or Verminator X? I saw the twist in the Nick show coming miles away.